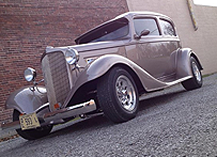 Transform your classic car into a modern marvel with T2G Customs of Wayne City, Illinois. Our professionals offer complete restoration to bring your vehicle back to perfect condition. Our techs take the time to make sure that your restorations is done flawlessly from start to finish. We begin by taking off the mirrors and emblems to sand and buffer your classic car, giving it a smooth surface. Our team also blends certain areas on the turnout that don't need to be broken down to restore it to a like-new condition. We can even revitalize the stainless aluminum and back to its original condition without replacing it. Contact us to transform your aging classic car into a well-oiled machine with our restoration services.